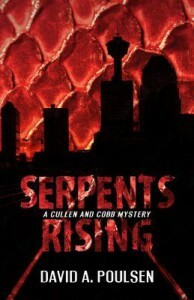 Serpents Rising is the first book in the new series about Cobb and Cullen. Eight years ago someone burned down Adam Cullen's home, and his wife with it. A year later he receives a message from the killer. The murderer is still on the loose. When private detective Cobb asks him to embark on an investigation finding a drug addict, they go looking for him and the arsonist. Overall, I thought this was a pretty decent detective novel set in Calgary. There's the main character Adam with his tragic backstory and the ex-cop turned private eye. Nothing new there, but it can still be enjoyable. Adam seemed genuinely still frustrated and upset (and not without reason) about the murder of his wife, although the jump to 'reopen' the investigation seemed a bit forced. As did the way the two of them started working together. The story is okay, it has the necessary twists and did at times surprise me (although I'd guessed the ending correctly), but wasn't overly original. Still, I had some nice hours reading the book as the writing itself wasn't anything special but nice to read as well. Adam's character had quite some character development throughout the story (I would like to read more about him), but Cobb's was a bit flat and I couldn't really care about him. Still, I think I would read the next instalment in this series.